Teboho Aaron Mokoena is a South African player who was born on 25th November 1980 in Boipatong, South Africa. He is currently the assistant manager of the national team and Bafana Bafana’s most capped player of all time. He was born on the 25th of November 1980 in Boipatong. As of 2018, he is 38 years old. His wife’s name is known as Jwalane Mokoena who he married in 2010. Aaron began his European football career at Bayern Leverkusen and Ajax. During his spell at Ajax, he went on loan to Germinal Beerschot and then to KRC Genk for two years. 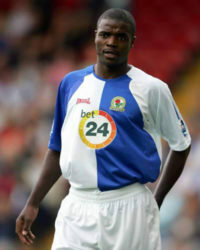 On the 4th of January 2005, Aaron Mokoena made what he described as the dream career move to Blackburn. He made his debut for Blackburn Rovers on the 8th of January 2005 in a FA Cup match against Cardiff City, coming on as a 43rd-minute substitute for Barry Ferguson. He made 101 appearances as a Blackburn player and was deployed as a holding midfielder. On the 24th of May 2009, he announced that he would be joining Premier League outfit Portsmouth on a three-year deal. Aaron made 77 appearances and scored two goals with an important last-minute goal against Coventry City at the Ricoh Arena in the FA Cup 3rd round replay on 12 January 2010. This was one of the most important goals in the clubs entire history as it sent them through to the 4th round of the competition which they ended up being runners up to Chelsea. Mokoena terminated his contract with Pompey on the 12th of July 2012. On the 11th of July 2012, Mokoena completed his move from Portsmouth to South African club, Bidvest Wits. On 20 July, he was officially presented at his new club. He has also represented South Africa. He has featured in the South African national team and U-23. He made 107 appearances for the South African national team, from 1999-2010 and he featured at the 2010 world cup at his homeland. Mokoena is also Bafana Bafana’s most capped player of all time.